Cerified Origin Paella Rice from L’Albufera Nature Preserve in Valencia,Spain It is a short grain and variety with a pearled colour. Its size is equivalent to that of the short grain rice, sometimes even smaller, yet Bomba rice more than doubles its size when cooked. It is much harder than any other variety in the world, thus allowing it to absorb more liquid (more flavours!) and aromas and that when cooked it is always “al dente”, loose and whole. This rice maintains its consistency even under extended cooking; it never becomes sticky, fluffy, or mushy. The grains remain separate and individually loose from one ideal desired feature for paella cooking. Bomba Rice - The best feature: It’s very difficult to overcook. Although it’s the ultimate for paella, it’s incredible for all types of rice dishes giving them its distinct, very appealing characteristics. How many servings are in a 1 kilo bag of paella rice? 1 kilo (1 Kg) of paella rice is generally enough for 10 servings. In more detail: Each 1 kilo bag contains 2.2 Lbs of rice, or about 4 cups uncooked rice. We recommend about 1/4 to 1/2 cup of rice per person. How much water do I add to my paella rice? 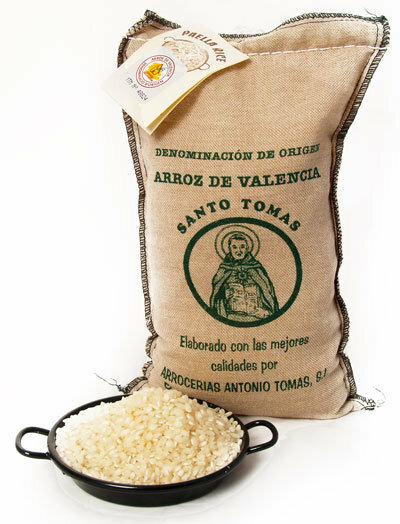 Our 'Santo Tomas Extra' Paella rice requires 2 cups of water/broth per cup of uncooked rice. Our 'Bomba' Paella rice requires 2 1/2 to 3 cups cups of water/broth per cup of uncooked rice.